The Mississippi Flyway begins to start its funnel in northeast Lousiana as it continues to the coast. Here, in the "Sportsman's Paradise," waterfowl hunting thrives, and most begin partaking in the sport at an early age. 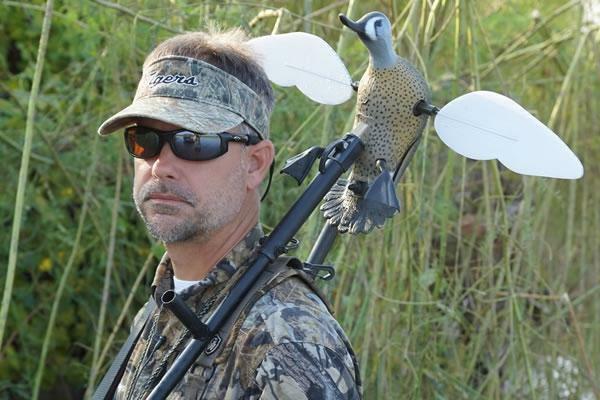 Chuck Smart was no exception.Chuck's backyard consists of the bayous, rivers, and wetlands of the Lower Mississippi Flyway in Louisiana which is ripe for a wide variety of hunting and fishing.He quickly became a fan of the shotgun and stuck to it like a duck to the water. In the late 90's, he was given the priviledge to hunt over the first MOJO Mallard that revolutionized the way we all hunt ducks. In 2000, Chuck became General Manager of MOJO and has chased ducks and geese across the North and South American continents from Alberta, Canada, to Argentina. In his free time, Chuck enjoys coaching summer youth baseball. However, he always tries to make room in the duckblind or boat to pass on the hunting and fishing tradition to his son, as well as other young hunters in hopes of keeping the sport alive. Big game hunting has also been very rewarding for Chuck. He has taken very nice antelope and mule deer along the way as well as some impressive trophy white tail deer that reside on his wall. As the General Manager of MOJO Outdoors, most people say, "Man you got it made, working in the outdoor industry and getting to hunt all over the world."